Last week, we have upgraded GoEatOut website platform to provide a faster and safer browsing environment to our visitors. Most of the changes will not be seen in the website except the login and registration pages. The design is cleaner than before and we hope this will help to decrease the invalid registration and login over the time. 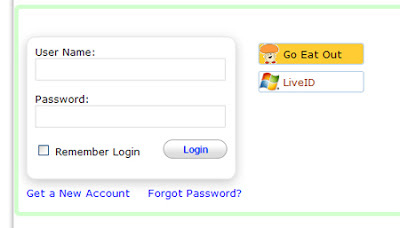 Also, we've integrated LiveID to provide a much convenient way for member to login GoEatOut portal. We plan to integrate FaceBook login in short future too. With the latest application platform, we also planned to provide a better site navigation and search function to visitors. Please give us some comment to improve GoEatOut!